I was so excited to review the Luminess Air Airbrush Makeup System! Why? I have always wanted to have that flawless airbrushed look. I am one of those women who do not leave my house without makeup on. I have way too many brown spots for someone my age. They make me so self conscious. Therefore, I am always in makeup. However, I have a hard time finding a good makeup that will cover the dark spots but not feel heavy and cakey. Insert Luminess Air! Luminess Air Cosmetics was developed by leading makeup artists from the fashion, print, television and film industries along with leading cosmetic chemists and colorists. Luminess Air formulators and cosmetics designers have a minimum of 15 to 30 years of experience in the cosmetics industry and have run the research and development departments of some of the leading cosmetics brands in the country. These quality formulations are rated amongst the best makeup in terms of quality, result and design. I received a kit that had everything I needed to get started. The first thing I did was watch the DVD that comes with the kit. This made things very easy. There was nothing to put together. You just plug it in and you are ready to go. The kit came with four shades of foundation which is nice. Two will be great for fall and winter. The other two will be great for summer when I am more tan. Color matching is easy. You can even blend more than one shade to get the perfect one for you! The kit also came with Flawless Airbrush Glow Enhancer, Natural Effects Airbrush Blush (in a great shade), Sun Perfect Airbrush Bronzer and Boost-it! Complexion Enhancing Primer. Check out this great video which shows you how easy it is to apply. This was all I had to do. Add a few drops to water to clean it out - spray into sink until clear - done! If it was the summer I would have also added the bronzer to the places where the sun naturally hits my face. For a more polished makeup look I like to add the Flawless Airbrush Glow Enhancer to the high brow bone and all around the eyes. 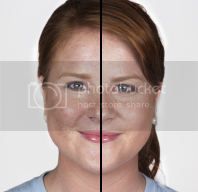 The woman pictured above has freckles and you can see how the before and after covers it beautifully! I had the same result with my brown spots. Just follow the steps above and Viola! I had great looking makeup and I was so shocked by how quick and way it was! No wonder celebrities use airbrush makeup all the time! The results look and feel amazing! If you want you achieve those results yourself, I suggest you add Luminess Air to your holiday wish list! Connect: You can find Luminess Air online. 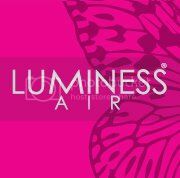 You can also keep up with Luminess Air on Facebook and Luminess Air on Twitter. They also have a Luminess Air Blog with some more great videos and reviews! 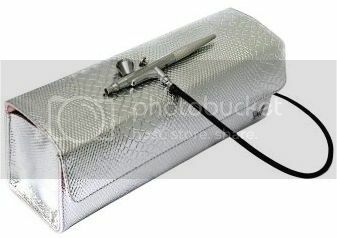 Buy It: You can purchase the Luminess Air Airbrush Makeup System at their online store. The systems start at $169.00.